Stock # PC088123, Intercooled Turbo Diesel I-4 2.0 L/120, 40529 mi. CARFAX 1-Owner, GREAT MILES 40,529! Heated Seats, NAV, Sunroof, iPod/MP3 Input, Satellite Radio, Onboard Communications System AND MORE! Navigation, Sunroof, Heated Driver Seat, Back-Up Camera, Turbocharged, Diesel, Satellite Radio, iPod/MP3 Input, CD Player, Onboard Communications System, Aluminum Wheels, Smart Device Integration, Heated Seats MP3 Player, Keyless Entry, Steering Wheel Controls, Child Safety Locks, Heated Mirrors. ROADSIDE ASSISTANCE KIT booster cables, warning triangle, flashlight, multi-tool, gloves, PVC tape, blanket, poncho, whistle, cable ties and bandages. 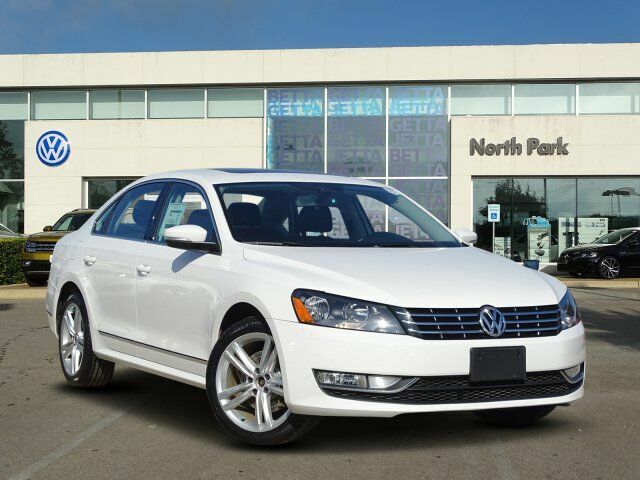 Volkswagen 2.0L TDI SE w/Sunroof & Nav with CANDY WHITE exterior and TITAN BLACK LEATHERETTE interior features a 4 Cylinder Engine with 150 HP at 3500 RPM*. Edmunds.com explains "The Passat's spacious interior caters to American tastes by allowing stretch-out room for adults both front and rear, as well as generous cargo capacity within its voluminous trunk.". Great Gas Mileage: 42 MPG Hwy.